It’s Friday, September 1st now. Minnesota. Leaves one more degree golden this morning. Heavy rain this evening. Am I happy? Well YES. 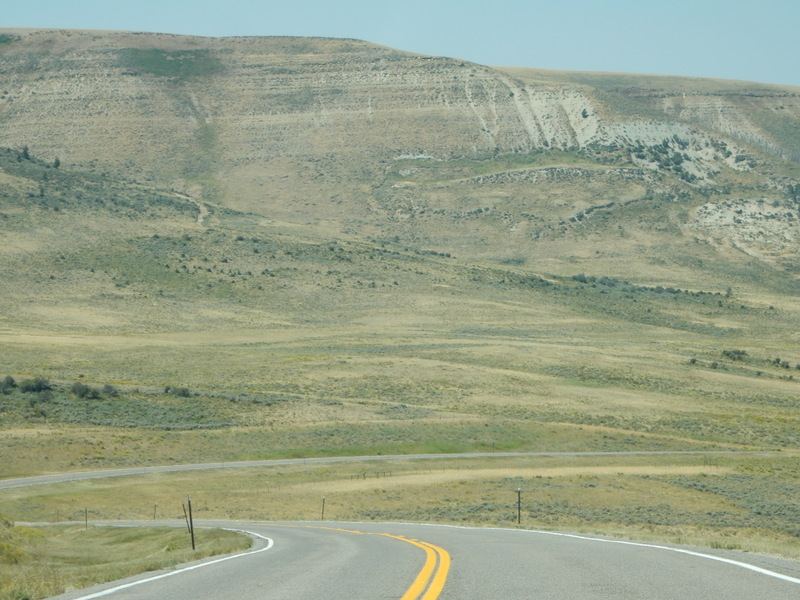 I drove through Wyoming last Sunday. Not sure I’ll do that again since I still have so many other places to see…maybe I will though because I cannot bear to say ‘never again’ to some places. I’ve already written about my childhood Green Grass of Wyoming books and what some poetically-inclined women have written about the state so, when I was thinking about what to post along with my pictures, I googled around and here’s what I found. I didn’t know about this poem/song but now that I do it seems a nice way to say goodbye to Wyoming—for now. Sorry, my photos are pretty lackluster because of feeling unwell and too tired to stop often and get good shots. Still they do represent much of the wide wide wide open spaces. 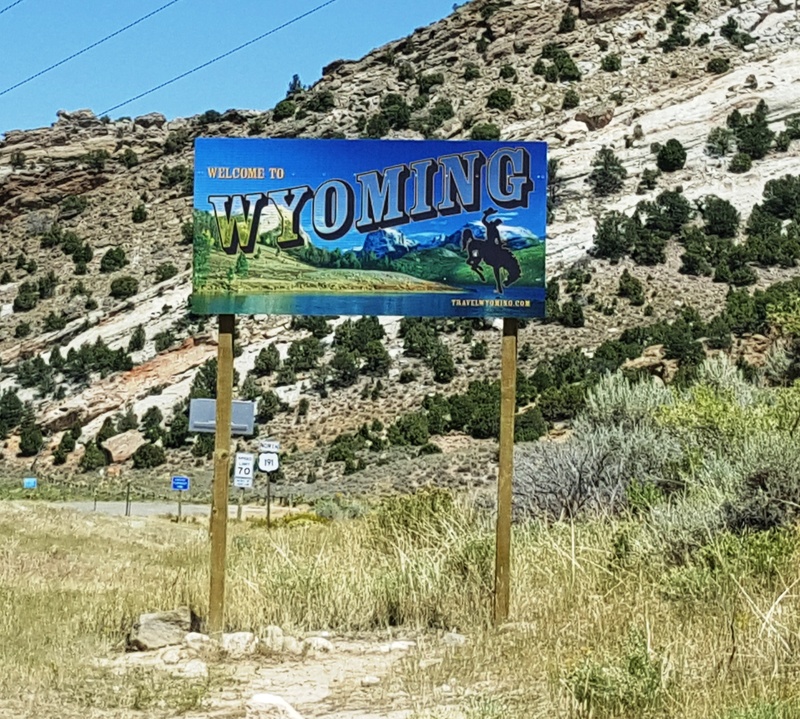 Sunday was a 12-hour drive but only because I stuck to my two-lane highways plan; I was stiff, achy, exhausted—with only the Ghost and the fact I was in Wyoming to keep me going. I continued on Highway 91 from Moab to Farson, Wyoming, then 28 to Lander and 20/26 into Casper—where I wandered around lost for nearly an hour looking for the La Quinta Inn which was cleverly concealed back in some corner. Good hotel though, clean, comfortable, at the high end of the budget motel market. Also had a decent breakfast buffet with delicious little pre-made omelets. Honestly. But that’s part of Monday’s story isn’t it? Marj, always so curious seeing all these photos and reading about your travel around the world including in the USA, a great country to drive through like you do instead of me and Vernon flying all over….PS. It was great seeing you again in Albuquerque and Santa Fe late July for Cie Herve KOUBI and I hope you equally enjoyed the show like we do, on and on again! Reading this the about an hour before leaving Dover. I remember Wyoming, so long ago. I drove the entire state from East to West, unfortunately it was not very pretty…that part of the state, that is. Looks like you found some more scenic areas that I did…but I was on my way to Salt Lake City at the time, then Reno, then San Francisco. The fun days of road travel. The road less traveled is indeed the best and you seem to always find the best. Happy Trails.